Top 20 Countries On The Internet & Future Predictions! Home > Blog > Blog > Top 20 Countries On The Internet & Future Predictions! 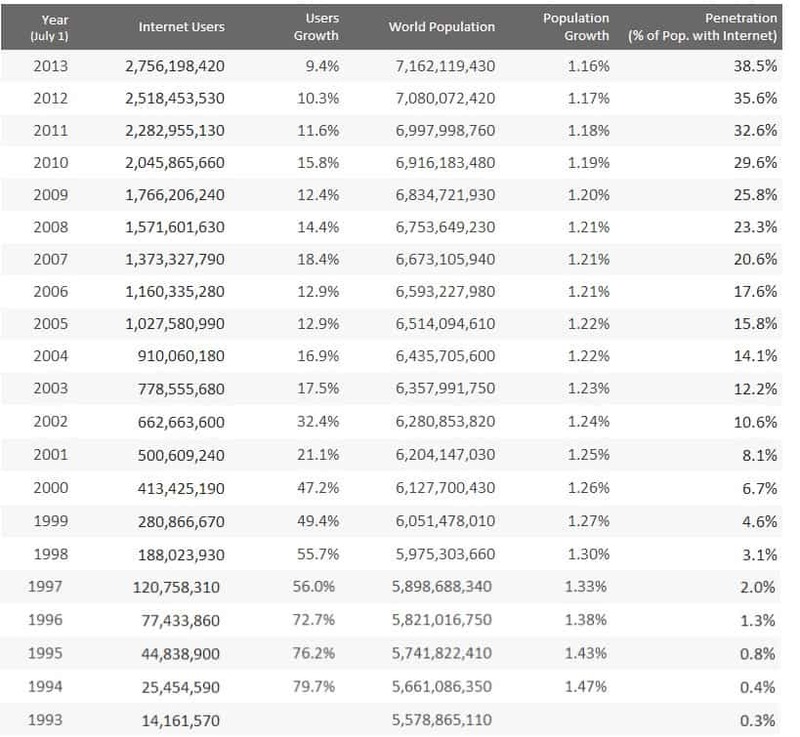 Around 40% of the world population has an internet connection today! Did you know it was less than 1% in the year 1995? Believe it or not but the number of internet users has increased tenfold from 1999 to 2013. It reached one billion in 2005, 2 billion in 2010 and the third billion will be reached in 2014. Let’s have look to the journey internet has covered, by year, region and country. Almost 75% of all internet users i.e. 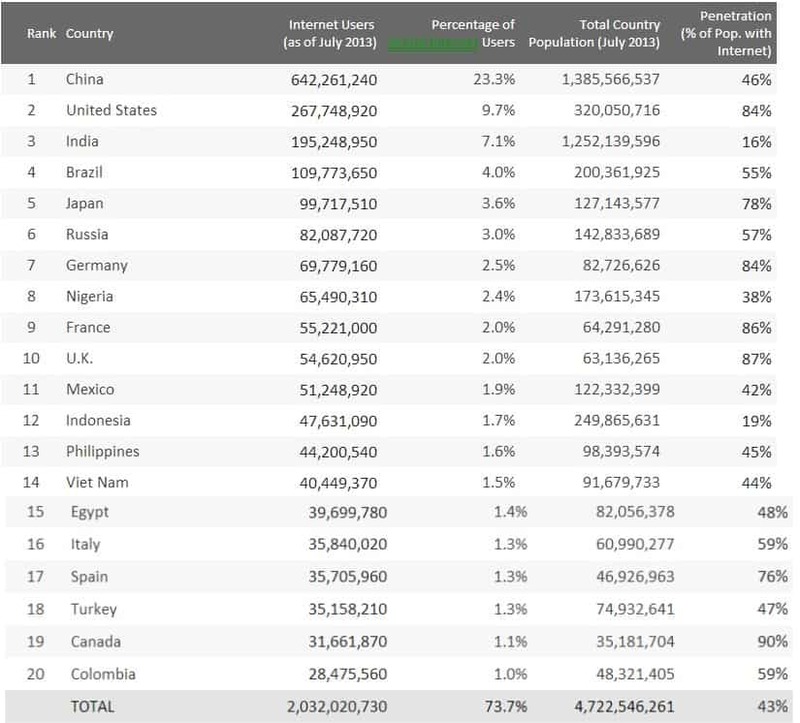 2 billion internet users in the world live in the top 20 countries as listed above. 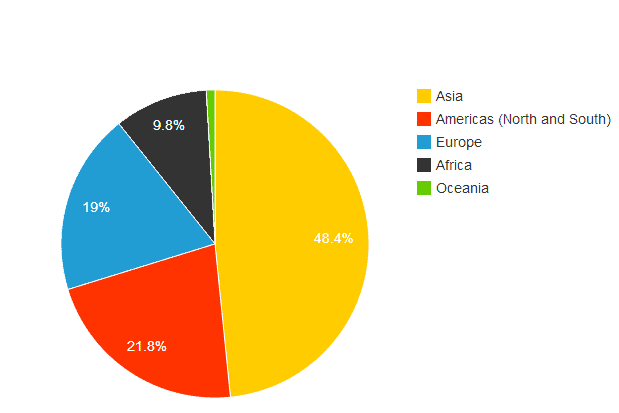 The remaining 25% is doled out among the rest 178 countries, each representing less than 1% of total users. As you can see China represents 23% of total internet usage in the world, which is more than the next three countries combined (United States, India, and Brazil). As far as internet penetration is concerned, India has lowest i.e. 16% while United States, Germany, France, U.K., and Canada have the highest penetration as over 80% of population in these countries has an internet connection. So, you can better imagine about the potential of India depending upon its population as with only 16% of internet penetration it hold the third position when it comes to number of internet users. The government is constantly working to increase internet penetration in India and has launched various projects like ‘Government to launch ‘Netra’ for internet surveillance’, ‘Google India launches campaign: 50 million women to get internet education in 1 year‘ and so on. So, talking about the future of internet in the world, you can easily make out which all countries are going to hold the top positions and how would they grow in terms of number of internet users, according to the changing internet penetration and the population of the countries.